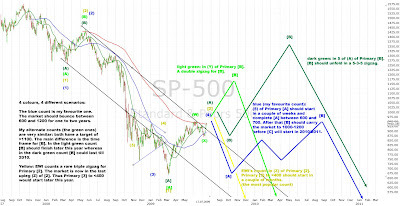 I'm still sticking by my count that the market is in Intermediate (4) of Primary  . If the market makes a new high (>956) I will move the low for Intermediate (3) to the November low ato 740. But if the coming down waves look corrective or if the market pushs higher to >1100 without any correction I will switch to one of my alternate counts. What I don't like is EWI's count. I just don't believe that the market will already begin a nasty Primary .